Yes, I am, in fact, a professional negotiator. Really. 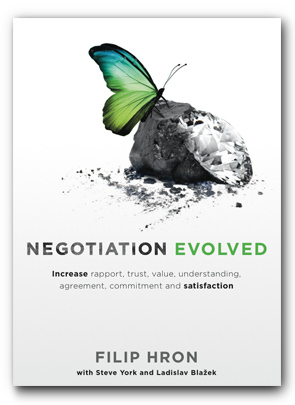 While I introduce four separate approaches to negotiation in my book, we all revert to the least productive approach from time to time; the one where parties seek to develop power in order to make the other give in. This is 10pm at night. In the bag my girlfriend has her phone, money, keys, ID, (and probably two bricks, a tent, scuba diving gear, a coffee machine…). We start walking away. About 50m away I look over my shoulder to make sure the bag is still there. My girlfriend smiles. She smells victory. She knows that I’m too uncomfortable with the risk of someone stealing the bag. 100m away. 150m away. The bag is now a small dot in the distance. As we pass a man walking in the opposite direction, I seize my chance to influence my girlfriend. Damn. She countered my tactic. Very uncomfortable with the risk and stakes in this negotiation, and not being able to take my eyes off the bag, I stop walking. No reaction from my girlfriend as she stands her ground. I start running towards the bag. Halfway there, red and blue lights start flashing from the dashboard, indicating that this is in fact an undercover police car. While running, I wave with both hands, signalling that it is my (girlfriend’s) bag. At this point the two under cover police officers smile and give each other a knowing look. I tell myself that this is because they understand what I’m going through here. And then she arrives, walking slowly towards us. I recognise that smug grin. It now extends from ear to ear. The cops drive away. I feel good about giving them something to talk about on their otherwise uneventful night shift. At this point the negotiation changed from negotiation game 1 to game 2, the one where we seek to understand and satisfy the needs of both parties.